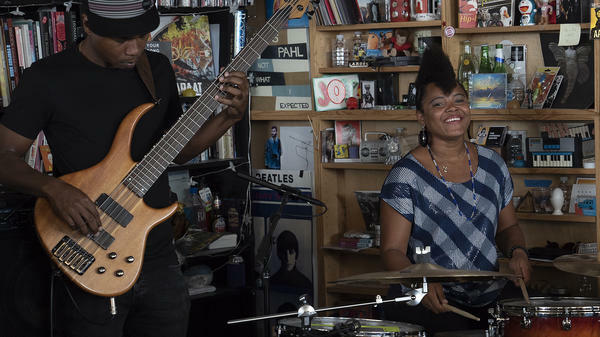 Yissy García & Bandancha perform a Tiny Desk Concert May 10, 2018 (Eslah Attar/NPR). From the moment you hear the pre-recorded sound collage underneath the credits, it's a sign we're not in the Buena Vista Social Club. The compositions (all by García) are modern and reflect the cosmopolitan attitude that is common in big city life in Cuba. For example, "Ultima Noticia" is highlighted by the riffs thrown back and forth between drummer García and the turntablist, DJ Jigüe. The command of time and imagination García displays in her first drum solo of the set is simply astonishing. The entire set is a lesson of contemporary Cuban music. The rapping on "Universo" reminded me of Cuba in the early 1990s when hip-hop entered the national consciousness as the Soviet Union left the island to fend for itself economically. On this track, it's a celebration of the universal goodness we all share. The band winds up their time behind the desk by going back to Cuba's African roots for a rumba-soaked jam with sampled Afro-Cuban drums and rhythms. The complexity of the music meshes lockstep with passionate singing and dancing. Yissy García and Bandancha are already Havana favorites, and I'm thrilled they're finally getting a chance to spread their music around the world. We are very fortunate that one of their stops was the Tiny Desk. "Te cogió lo que anda"
Producers: Felix Contreras, Morgan Noelle Smith; Creative Director: Bob Boilen; Audio Engineer: Josh Rogosin; Videographers: Morgan Noelle Smith, Kara Frame, CJ Riculan; Photo: Eslah Attar/NPR.